These innovative creations, available now as prototypes, are rough drafts for technology that could be transformative when it's perfected. A demo version of Samsung's transparent LCD screen shows off its visual slickness. A seemingly ordinary, transparent piece of glass suddenly illuminates with video. 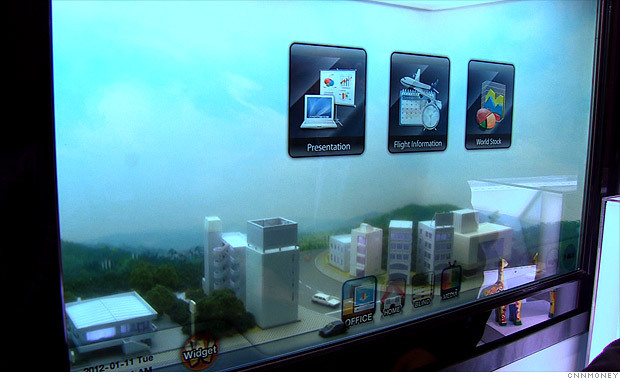 It's Samsung's new transparent LCD screen, a breakthrough that could one day make any window into a display or touchscreen. Currently, Samsung is only marketing the transparent screen to showrooms for display cases. But the company has grander visions. For instance, Samsung has been testing its invention on vending machines in Boston. The clear glass on the machines' windows can advertise a particular product and display nutrition information. The spectacle has been a success, with sales in vending machines equipped with the transparent LCDs up 600% over run-of-the-mill vending machines, Samsung says. Normal TV screens require back- or side-lighting to display an image, but Samsung's transparent screen uses ambient light like sunlight or room lighting. That makes the product relatively cheap, since a large chunk of the cost of a TV or computer screen is in the illumination technology. Your office, circa 2022. could be filled with cool toys like 3-D printers, hologram tables, and windows that turn into media screens. Printing prosthetics, engines, and jets!